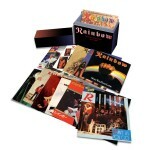 Share the post "Album review: RAINBOW – The Singles Box Set 1975–1986"
Those lovely guys at Universal have really gone to town (again) here – and a set that will be beyond most fans’ needs (or price range); but the extravagance here matches the marvel of the fantastic music. Formed in 1974/5 by guitarist Ritchie Blackmore, while still in Deep Purple, Rainbow were one of the most successful and important rock bands of the era and, over their change of style and revolving door personnel, produced some of the finest rock music you’ll ever. No Question. Now, most will immediately point out that Rainbow released nothing like 19 singles in the UK, but (predominantly in the earlier years) with the inclusion of several world-wide variations, there is some repetition (2 studio and 2 live versions of Man On The Silver Mountain, for example). So to start from the beginning, the aforementioned Silver Mountain, it’s classic hard rock and a solid riff, a track that became a live staple for many years to come. Across 3 singles we get 7 tracks from that debut, a line-up was effectively Elf with Blackmore. Ronnie Dio’s vocals always a standout. Rainbow Rising had no singles in the UK but “Starstruck” from that album is a real corker – and probably featuring the best line-up of Dio/Blackmore/Powell/Carey/Bain. The following year’s On Stage live album did see a 3 track EP, featuring edited tracks from that album. “Man On The Silver Mountain” and Purple’s “Mistreated” often got overplayed and overextended live, but the standout (not just here, but of Rainbow’s entire career) is the live version of “Kill The King”. Recorded prior to the studio version on Long Live Rock’n’Roll, and with the Rising line-up, it is sheer blistering brilliance. Blackmore is on top form, Cozy Powell thunderous, and Tony Carey’s keyboards not only showing wizardry but also high in the mix. If only this arrangement had transposed to the studio version. There were two singles from Long Live Rock’n’Roll before Dio departed, and 1979’s Down To Earth, featuring vocalist Graham Bonnet and keyboard player Don Airey. Gone were the fantasy themes, this is the first nod at Rainbow’s more commercial direction, but some damn fine rock singles in Since You Been Gone and All Night Long. Bonnet’s powerful vocals suited the music perfectly. With Joe Lynn Turner on board, Difficult To Cure was more commercial but tracks like I Surrender and Can’t Happen Here are really catchy and enjoyable. A successful period for the band. More variant singles see the title track and a few others featured, all good stuff. The “Stone Cold” and “Death Alley Driver” singles were stronger tracks from what is probably Rainbow’s weakest (certainly most inconsistent) album, Straight Between The Eyes. The final album of the era, Bent Out Of Shape, is by contrast one of the most consistent (if poppy) of the Rainbow catalogue. I’ve always had a soft spot for tracks like Street Of Dreams and Can’t Let You Go (both singles). For the more poppy era, Turner had some seriously strong vocals. Fans will have most of these tracks already, but over the 19 singles there are plenty of 7” edits, non-album tracks and live B-sides. Never a dull moment. Beginning to end, the packaging and music are a sheer delight. Repetitions and duplications aside, this is definitely one for the collector, to relish. This entry was posted in ALBUM REVIEWS, ALBUM REVIEWS (Mobile), All Posts and tagged album, Cozy Powell, Don Airey, Graham Bonnet, Joe Lynn Turner, Rainbow, review, Ritchie Blackmore, The Singles Box Set 1975–1986. Bookmark the permalink.